'Sky Soldier' Michael Gabel Killed in Afghanistan Army Staff Sgt. Michael Gabel, 30, was killed last week in a roadside blast in Afghanistan. In a story NPR aired last month, Gabel spoke eloquently about the loss of his best friend in the line of duty. Army Staff Sgt. 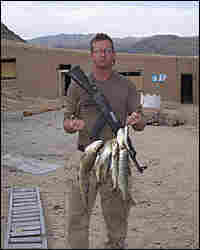 Michael Gabel "believed in Afghanistan," his brother David said. "He really wanted to see schools, jobs and opportunities brought to the country." Michael Gabel was killed last week. Army Staff Sgt. Michael Gabel, 30, was killed last week in Afghanistan. In a story NPR aired last month, Gabel spoke eloquently about the loss of his best friend in the line of duty. At the memorial service for three U.S. Army paratroopers who died in Kunar province, Gabel delivered a moving eulogy for his comrade, Larry Rougle. Holding back tears, he told the crowd, "I will not be bitter. I will not shed a tear of sorrow. I am proud to have known such a good man and a warrior to the bitter end. Until we see each other again, sky soldiers!" On Dec. 12, Gabel died in a roadside bomb blast. 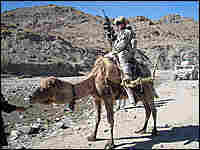 He was in the lead vehicle of a convoy securing a stretch of road in the southeastern Paktika Province. The Baton Rouge native, who enlisted in the Army in 2000, was serving as a Sky Trooper with 173rd Airborne brigade. It was his third tour in Afghanistan. He had also served in Iraq. His brother David Gabel said Michael had planned to re-enlist next year so he could serve more time in Afghanistan, a country that he loved. 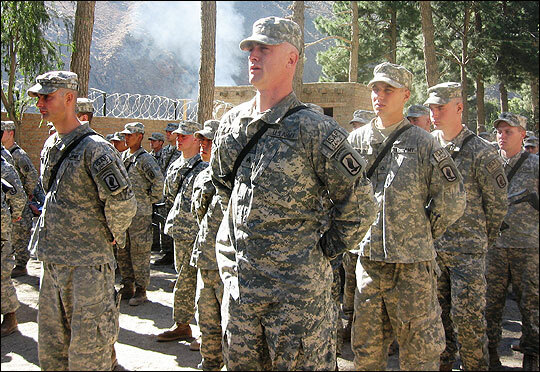 "My brother believed in Afghanistan," David Gabel said. "He really wanted to see schools, jobs and opportunities brought to the country. 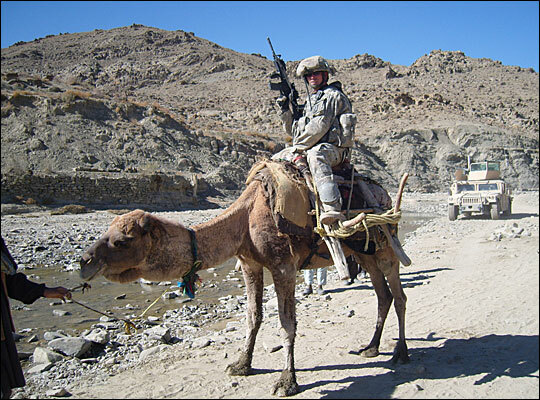 It was his third tour in Afghanistan, and the job there was unfinished." 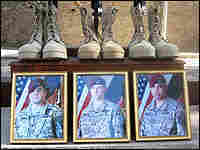 Soldiers pay their respect to three fallen comrades at a memorial service at Camp Blessing in the Kunar Province, Afghanistan. Sgt. Eric Gallarado, squad leader to late Sgt. Joshua Brennan, holds the dead soldier's guitar, which has condolence messages from his platoon inscribed on it. The guitar will be given to Brennan's family. 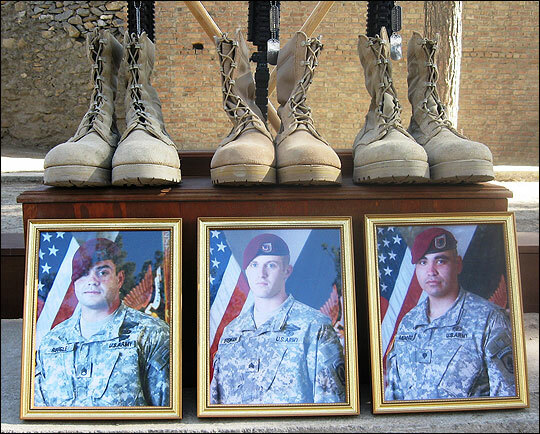 Soldiers remember their friends with memorials made of their helmets, boots, M4s and dog tags. 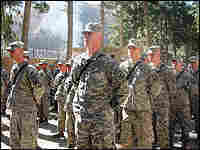 In northeastern Afghanistan on Friday, American soldiers held a memorial service for three of their comrades slain in what the U.S. military says has become the busiest combat theater in the country. The place is called Kunar, a mountainous province along the border with Pakistan. The service took place in a shady field at Camp Blessing, where scores of soldiers gathered to mourn three of their own from the 173rd Airborne Brigade combat team. Nearby, Blackhawk helicopters took off and landed, a reminder that the war outside the camp is far from over. But for the moment, the soldiers paused to remember their comrades killed in late October. One was fatally shot when his position was overrun by militants. The others died two days later in an ambush. The men, who were in their 20s, are regaled as tough-as-nail warriors. But each is also remembered for his softer side: Staff Sgt. Larry Rougle as a doting father to his young daughter; Sgt. Joshua Brennan as a lover of music and the guitar that he played whenever he got the chance; and Spc. Hugo Mendoza as a caring medic. Staff Sgt. Michael Gabel eulogized Rougle, his best friend. "I will not be bitter," Gabel said. "I will not shed any tears of sorrow. I'm proud to have known such a good man and a warrior to the bitter end. Until we see each other again, sky soldiers!" The tears come anyway. The paratroopers comfort each other with hugs and pats on the back. Still, Sgt. Benjamin Sanchez Jr., says that on days like this, it's hard to keep going. "It just seems we are trying to win over the people, but it's very difficult. The enemy is trying to win them over, too, and it's a tug of war with the enemy and ourselves," he says. "It seems sometimes we take two steps forward and on another day we take two steps back." This is how many at Camp Blessing see the fight in this part of Kunar province. A battle waged in tree-covered mountains lining the Korengal Valley. Their enemy includes foreign fighters who come from nearby Pakistan — and Taliban fighters who also recruit underemployed local youth to attack troops. Some officers say the insurgents, despite their heavy losses, are growing more brazen. Nowadays, they usually fight American and Afghan soldiers up close. The sounds of battle could be heard during the memorial service. A boom heard during Chaplain David Schnarr's prayer was one of the camp's 1-5-5 Howitzers, fired on Taliban positions several miles away. Seven of the 10 soldiers killed in Kunar since June are from Capt. Daniel Kearney's battle company. He calls his men heroes. "They are like my family. They are like my little brother. I don't like people picking on my little brother at home I don't like people picking on my little brothers here so it ends up making the boys angry and stuff like that," he said. "But there's not much I can do about it except for keep on pushing the boys to go out there and do everything that they are doing already." Nearby, Sgt. Brennan's platoon-mates finish writing messages of condolence on the dead man's guitar. 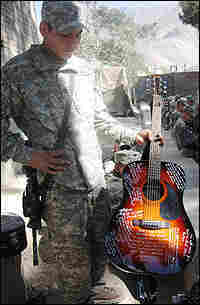 His squad leader says he will send the guitar to Brennan's family.